We are so pleased that many of our friends not only share our love of raptors and desire to learn more about them, but also want to do whatever they can to help. In Minnesota, great horned owlets will soon be the first raptor babies of the season to take their first steps on a branch. As the spring and summer arrive, more raptor babies will be vulnerable to weather and the inevitable challenges of sharing their territories with humans. Below are five things that YOU can do to help raptors. 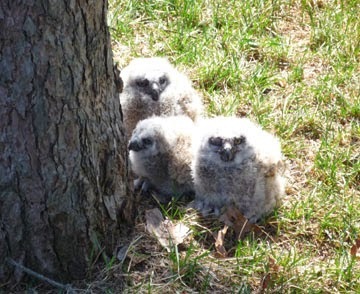 1) Help Us Find Nests for Youngsters. It is critical to get uninjured baby raptors back to either their own parents, or to foster them into another family of their species as quickly as possible. We cannot raise them as successfully as wild parents can! If you are in the Minnesota/Dakotas/Wisconsin area you can help by letting us know about active raptor nests. Then, if we need to foster a youngster into a new nest, we will have some on file to choose from to make the best match. Contact Lori Arent, our Clinic Manager, at arent@umn.edu. 2) Cap Your Chimney. Cavity nesting species, like several species of owls, can get trapped in what they perceive to be a welcoming cavity – a chimney. The birds can’t free themselves, often get injured while trying to escape, and become malnourished if stuck for more than a few days. Make sure that if you have a chimney it is properly fitted with a cap. Local chimney companies can provide that service. Many of the chimneys in question have smooth pipe on the inside, making them uninhabitable for chimney swifts, as well as impossible for other animals who investigate them to get out. 3) Don’t Cut Down Your Trees. If you need tree work to be done, schedule it so it does not conflict with the nesting season of birds and mammals that may inhabit them. People are often unaware of the wildlife that calls their property “home”. Do not pick the youngster up. Please call TRC if you are in our area, or your own local rehabilitators, for consultation. Taking a photo from a safe distance will help determine if the bird does indeed need a trip to the clinic for aid, or perhaps just needs some space and time. Thank you to the public and agencies who care enough to let us know about these youngsters. If you are in doubt as to how to help if you see a young raptor, again please call us at 612-624-4745. Please consider forwarding this link/story to friends. Education is one of our best resources to help young raptors. How Can We Tell Our Red-Tailed Hawks Apart? TRC - Coming to a Site Near You? Get Started Birding with Festivals! I Wonder . . . Why Don't Bird Feet Get Cold?